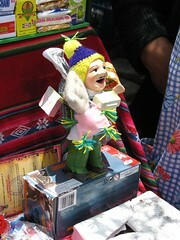 January 24th (Wednesday) marked the Alasitas Festival in La Paz – the festival of abundance. I went Wed at lunch to check it out and see what there was to see! The festival celebrates dreams and expectations for abundance in the coming year. It takes place all over the city, and there was one location near my office. The courtyard was overtaken by people with small tables, or on the ground, selling things in miniature. The idea is you buy the things that you would like to have in real life, but in miniature. Each item represents a dream, and if you buy it and have it blessed, it will come true in the following year. There is a God of Abundance, Ekeko. His figurines are adorned with lots of ‘stuff’ and legend has it that he has a cigarette every Friday. I have survived my first illness of the year. Working in water and sanitation, I am very aware of the little things that can lurk in food and water that you really don’t want to ingest. I spend my time trying to decrease people’s risk of getting sick from contaminated water and contaminated food. I guess it is about time one of these organisms struck back! I woke up on Sunday not feeling very well – slightly nauseous and, without going into details, needing to use the toilet quite often. I couldn’t eat breakfast, so went back to bed. To be safe, Susana (the woman I live with and my boss), called a doctor. This is the point where my food was coming up as well. Lucky for me, doctors make house calls in Bolivia, even on a Sunday – for the low low price of 200Bs (about $30). Within 30 minutes the doctor was in my room giving me a full check-up to determine what the problem was. Her prognosis was that I have a bacterial intestinal infection, likely caused by E.coli or some other waterborne bacteria. Summer in La Paz is in full swing. This is not, however, anything like summer in Ottawa or anywhere in Ontario. It might actually get warmer in Moosonee. I would compare summer here to an early May day in Ottawa. The temperature fluctuates every day from about 5 or 6C in the morning to about 12 or 15C in the afternoon. Because La Paz is at such a high elevation (3,600m), it doesn’t actually get hot and any heat built up during the day dissipates as soon as the sun goes down. But it is lovely to walk home for lunch without even needing a sweater on a sunny day. The winter will be cooler, with lows around zero at night, and the highs a little lower than in summer. 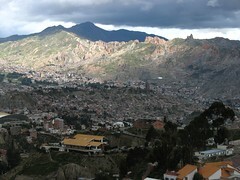 I visited a lookout, called Mirador Monticulo, in the centre of La Paz this afternoon. The views from the lookout were amazing. I've posted my pictures on Flickr. There has been some unrest in Cochabamba in the last few days. Before anyone starts to worry about me, it was confined to Cochabamba and seems to have calmed down now. Cochabamba is over 200km from La Paz (straight-line distance), and there are also a few mountains between the two cities. Bolivia is divided into departments, something like Canada’s provinces. There are 9 departments, and each has an elected leader, who is called a Prefect (similar to the Premier of a Province). The most recent election was the first time that the Prefects were elected and not appointed by the President. The President of Bolivia, Evo Morales, is on the left side of the political scale. However, several of the Prefects are much further on the right. This all makes for interesting political dynamics! In addition to this, there are several Prefects who want their departments to separate from Bolivia. This is how the problems in Cochabamba flared up. I've posted a few photos from around my neighbourhood. The UNICEF office is about a 15 min walk from the house, which is good! Take a look to see what La Paz looks like! I arrived in La Paz at about 7am on Wed morning. Flying into La Paz I could see the Altiplano (High Plain), which is the largest expanse of level land in the Andes. It extends from Bolivia into Southern Peru, northwestern Argentina and northern Chile. It was certainly an impressive expanse of land. The portion that we flew over contained mainly farms, and not one single tree. Susana (my boss) was there to meet me at the airport with the UNICEF driver. We had to go in search of my luggage, because somehow it got here Tuesday. I’m not sure how, because my flight from Chicago to Miami (delayed) landed at the same time my connecting flight to La Paz was taking off. However, I eventually got my luggage and we were off into the city! The airport is actually located in another city called El Alto, which is located above La Paz. 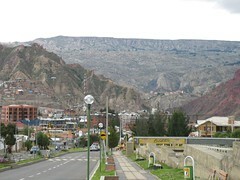 La Paz is located in a valley and is spread up the sides of the mountains. So we drove down into La Paz. Unfortunately it was a bit foggy, but some of the views were still magnificent (I will take and post pictures at some point!). What will I be doing in Bolivia? Well, I’m stuck in Miami at the moment. I was supposed to arrive in La Paz at 6:30am this morning. Instead I will arrive there at 6:30am tomorrow. My flight from Chicago to Miami was delayed just long enough for me to miss my connecting flight from Miami to La Paz. So, I stayed in a casino/hotel near the Everglades on the outskirts of Miami last night, paid for by American Airlines. There is only one flight a day from Miami to La Paz, so I am now in the airport waiting until then! So I thought I would take this time to write a bit about what it is exactly that I will be doing while I am in Bolivia. 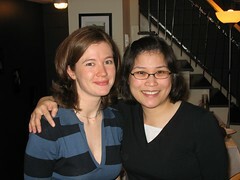 I said goodbye to all my Ottawa-based friends last night. Dave and I had a party at our house and invited most of the people we hang out with on a regular basis, some of whom know each other and some who don't. There were friends of mine from high school, friends from Ultimate, friends from EWB, friends from University, Dave's sister and brother in-law came from Belleville for the occasion and my brother and his fiancee made it as well. It was great to be able to see everyone before I leave on Monday. I think we had a peak of about 25 people in our house. There was lots of good food on hand (thanks Jenn for everything you brought!!). I had a great time - thanks all for coming out! My flight is one week from today. I will leave from Ottawa around noon on January 8th, and arrive in La Paz at 6:30am on January 9th. It will be a long trip and I think I will be fairly exhausted by the time I get there! This week will be busy with preparations and last minute purchases of things that I will need to bring with me. I don't have a lot of things left to do, but there are a number of small errands that I need to run, like going to the OHIP office to extend my coverage while I am out of the country. The big-ticket items have all been taken care of - I have my Visa, my airplane ticket and my vaccinations are all up-to-date.